If you’ve left your social media alone for the Easter hols, you might just have missed this fascinating tale of the guys who crept and leapt their way to the top of the Shard and took some unbelievably good photos. Unbelievably good? Well, let’s have a closer look. There’s a certain skeptical mind that sees stories like this and begins to ask questions. Not “was it all faked?” questions. Not at first. But the more mundane ones. When did this happen? How did they get those shots? What kit did they use? And these then prompt further ones like: if it didn’t happen recently, why hold off telling the story until now? And do the details given in the story check out–was the site actually accessible they way they describe it?–was it credible that such a complex site, so close to the City of London, could possibly be that lightly protected? Were there no intruder detection or other observation systems? Just one, lonely, bored guard? We can’t answer all these straight away–not without some inside knowledge of the Shard’s geography and security–but we can take a closer look. So, when did this exploration actually take place? The post(s) skim over this. It wasn’t that recent, it would seem. The shot of the Shard from the ground shows the glass and steel cladding barely two-thirds of the way up the concrete core. It’s now pretty much at the top. So, a while back. The Silentuk post says the trigger was the newspaper coverage of the core topping out. Well, that was back in December 2010. Both accounts talk of a crisp, cold night (and the pics do look wintry). To get a more accurate answer, remember that digital cameras do more than just make images. They decorate those images with metadata that tell a rich and detailed story about how, when and sometimes even where, a picture was taken. The metadata on the Silentuk images has been stripped away. But the Placehacking photos are more fruitful. And we can find out some interesting things… The first image I looked at yields some helpful metadata goodies. The date, for starters–and it’s not recent. At all. It’s 31 Jan 2011. Over 14 months ago. The timestamp is 2.15 in the morning. Well, that does check out with the topping out story, and the account of the timing in the early hours. But what else do we see? That the image was shot with a Nikon D90, serial no. 3119164, and the snapper has done the very professional thing of putting his name (and copyright assertions) into the metadata as well. So this is credited to one Bradley L. Garrett, of ████, ████████████ [Full geographical address redacted at photographer’s request]. Oh, and you can reach him on 951-███-████. Or by email at… etc, etc. Spooky, huh? But that checks out, doesn’t it? Bradley is named as the author of the Placehacking post. And if you put that serial number into this little utility you find other pictures on the Internet that it’s taken. And as they tend towards the aerial, I’m happy to believe that Bradley’s Nikon was put to good use. Or else a great deal of attention to detail has been put in to add this “credible” metadata to some bodged together pics. Now the Silentuk post is written by (or at least the comments this evening are appearing under the byline of) “Otter”. But that’s ok, because Google seems happy that Bradley and Otter have been associated before in reports of other exploration missions. And Otter is using his own camera, a Canon 550D, which explains the difference in metadata, and indeed image quality. What about that lovely gigapixel image (the huge panorama) on the Silentuk post though? As with all the Silentuk versions of the images, the metadata is largely blank. This isn’t dodgy, as many normal things that happen during editing and format conversion can strip out metadata. But it does have a “created date”. Of 10 Jan 2011. Three weeks before the likely date of this adventure. Interestingly, another of the Silentuk shots has a created date of 1 Jan 2011, at 2.27am. How do we account for that? Enough of the metadata, what of the images? I’ll focus on the D90 ones. The first thing that caught my eye was the deep field of focus, especially on shots like that self-portrait mentioned above. The guy’s face is (reasonably) sharp; and so is the city behind. The second thing that’s immediately obvious is just how much light has been captured from the city below in lots of the images. Things like the highly luminescent reflections on the river, and the “starbursting” of some of the lights suggest that these weren’t particularly wide aperture (but we’ll check this in the metadata again in a moment). What the images do suggest is long exposures. Really quite long. So back to the metadata–and there it is: a moderate/tight aperture (f/8.0), a high quality, low sensitivity ISO setting (125) and a whacking great FIFTEEN SECONDS of open shutter. Yes, that all makes sense. But to get the subject’s face that sharp; held still for 15 seconds? In the reported windy conditions? Judge for yourself. Try taking a 15 second exposure of a friend holding their head still (even assuming you do fix the camera steady and they’re not clinging to a ladder high in the sky in a howling wind with their muscles cramping). And the exposure balance–between foreground and background? It’s beautifully done, no doubt about that. This image in particular impressed me. Really impressed me. To get that amount of foreground detail (a readable newspaper tucked in the cab!) as well as a superbly exposed city background–well, hats off to the photographer for that, and all the other great captures fired off in what he reports as a very short stay at the top. So, is it all real? Miraculous long exposures, steady despite the wind and cramped muscles? A big portfolio of images in a very short space of time? All perfectly possible–and evidence of great skill and daring. Security that didn’t seem that interested, even after apprehending an intruder? Maybe. But sitting on a story like this for fourteen months? I guess that’s the hardest part to swallow. What do you reckon? Me? I prefer to keep my distance from the damn thing. Terrifying. Whoever went up there, whenever, and for how long, with a hand steady enough to produce anything at all, has my respect. Big thanks to Dan for suggesting that spectacular pun as a title, even before I’d finished writing the post. Of course it happened. Jeez. The only reason it was sat on was because we wanted to go in again once it topped out fully, but then the security had got REALLY militant. I’m not sure there is a fraud. The cladding on the latter photo exactly matches the cladding on the external picture in the Placehacker post. So at the very least the external picture probably was taken when the EXIF data says it was. Next I checked out Bradley L Garrett on Google. He’s a PhD student at Royal Holloway, University of London. He has a web page which is hosted by them. It gives his London address and telephone number. He’s also on Twitter as @goblinmerchant. I’ll defer to you on the technical questions you raise about these photos, but I’m not sure how you would fake them. I’m pretty sure you can’t change the date or time on a tweet, so what is clear is that Garrett and Murphy have been saying they climbed the Shard ever since 31 January 2011. I’ve had a look at the pano. Firstly of course, it must be said that it’s great that they went up there and shot this. But the numbers relating to the pano on silentuk make no sense whatsoever. It’s probably no more than 80-100 shots in total to create a 1 gigapixel image (see my comment on the blog post). Assume 5 second exposure (look at the vehicle trail lights), and a couple of seconds for settling of the tripod head, and with the right kit, this pano could be shot in a little over 10 minutes. Got a reply to my post. It all makes perfect sense. No way is this a fraud. 1. If they went public they wouldn’t be able to go up again as security would be beefed up. 2. People who do this sort of thing actually have a social conscience, they don’t want others following their route up and doing something stupid. Another good reason for sitting on the photos for 14 months: the photos are included in this bloke’s PhD thesis – see his website for the thesis pdf – and he probably spent a lot of the intervening time writing his thesis, and balancing the competing demands of getting the thesis right (and accepted) and the incentive to go public. I can assure you they are genuine, I was one of the many who did it. I’m more surprised there was any doubt that the photos were legitimate. These ‘explorers’ (I know there isn’t a generic term that suits all) have been doing this form of photography for many years. I’ve been following it for years and greatly enjoy the reports, as much as the photos. There’s a lot of debate and moral argument among individuals, but if there’s any identifiable group behaviour it’s – curiosity, mixed with humility. Show-boating is absent. In truth, ‘matter-of-fact’ delivery is part of the humour ‘…just nipped up the Shard for a few pics, a little windy but otherwise, not too bad’. 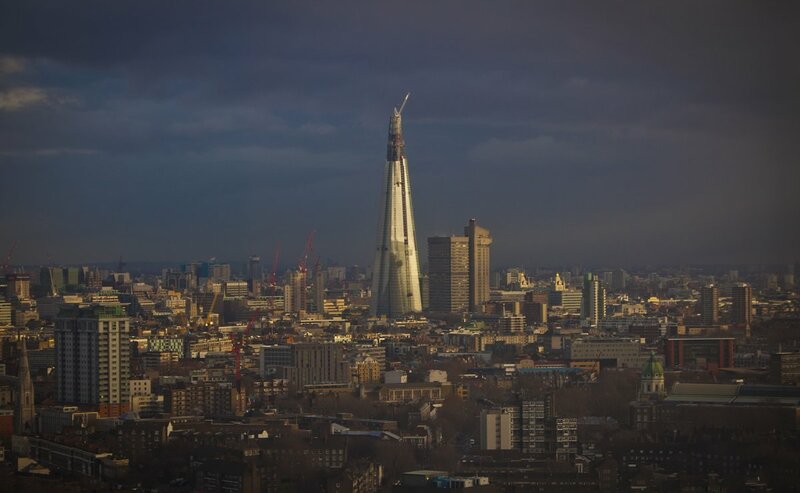 Publishing a fake set of Shard photos for publicity purposes, rings so hollow, it ‘clangs’. The people involved have reputations, and fictionalising an account would destroy what has been established over years. Not reputation for the purposes of developing an ego-fuelled, on-line profile, but because the people following their exploits are as interested in what they do, as they are themselves. Why risk that? There would be no reward and no motive for fiction. I’ve never met any of the exploring community, so my opinions would appear to be baseless – but equally, I have no reason for supporting or condemning them. I’m independent in that respect. I also suspect I’d fall off a building, if I tried to climb up one these days. I did something similar in my school years & when first in London in the early 80s. Abandoned buildings, late at night, the odd sprint from security, though the targets were much more modest. It has a surreal element (shuffling around in the dark, bumping into things, sniggering) blended with a hyper-real element (probably the adrenalin), which combined is addictive. When I read the reports, it brings the memories back. The ‘Holy Grail’ account about the Underground mail system is a page-turner. I highly recommend it. So, I appreciate what you’re doing and why you’re doing it. Personally speaking, ‘integrity is inversely proportional to the sum of money at stake’. There’s no money in ‘exploring’ – they said they climbed and shot from the top of The Shard, because they did. In fact, we recorded 12:40 on a ladder leaning against my house in my backyard with a simple 3 point light setup, and then I modeled the whole of London in Maya and motion tracked the footage over it with Flame. Super simple stuff, took about six hours. Well worth it too! has it occured to you, regarding the exif data, that maybe silentuk had the date set wrong on his camera by mistake? You must be off yer rocker. Pretty much every explorer in London, hell every explorer in the UK (not to mention a few BASE jumpers) did this during a period stretching 8 months. It’s old news. The reason no one reported it till recently is because to do so before it was finished would have been counter-productive…ya dig?! And RVD, you have it in one. It was a fun place to be, but the level of media interest utterly astounds me. Holding still for 15 seconds: not really required as the subject in the foreground would be ‘frozen’ by the use of ‘fill-in’ flash. As long as the subject holds still for the duration of the flash (clearly much less than a second) then the image of him would be sharp. Subsequent movements would not be picked up if he is not illuminated significantly. Yes, I did wonder about a splash of flash to freeze the foreground. The metadata says the flash didn’t fire, but obviously that would still be the case if an external flash was used. And given there is quite a bit of ambient light reflection in his glasses, I’d have expected any strobe light to be quite evident there. All very nicely done, however it was achieved. “Sitting on a story like this for fourteen months is the hardest part to swallow”? Dude, this is just an appetizer. The best stuff will probably see the daylight in 2020. Save the date. No flash was used. Standing still for 15s when holding a ladder (or handrail, etc.) is very easy. Try it! Otter and Brad adventures happened on different nights.